The Coral Triangle is an area of tropical waters in the South Pacific that ranges from the Philippines to the north, the Solomon Islands to the east, and Indonesia to the west. It is considered to be the center of marine biodiversity, having the greatest range and number of aquatic species in the world. And it is one of the most fragile and threatened regions in the ocean. 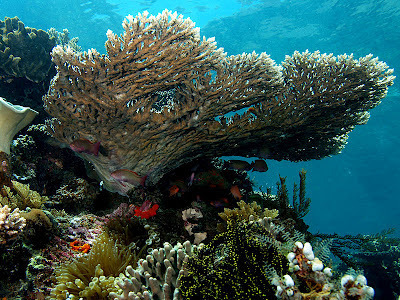 The Philippine's ABS-CBN.com reported on the consensus of several recognized marine scientists that a concerted effort must be made to protect the Coral Triangle from the effects of climate change, acidification, and other man-made threats. It was interesting to note that their concerns focused on the social-economic and political implications of what would happen should the Coral Triangle continue on it's current path. Considering the implications on mankind, as opposed to the ecosystem itself, is often a good strategy in gaining the attention of policy makers. Interesting article, so I thought I would post it here in its entirety. CAIRNS, Australia - The Philippines and the other countries in the Coral Triangle should step up their efforts and investments to conserve “the most productive” reef ecosystem in the world, scientists said on Tuesday. Overfishing, pollution, coastal development, climate change and ocean acidification are endangering the coral reefs of Southeast Asia and Western Pacific, which could lead to conflicts, food insecurity, and political instability in the region. Jompa said national governments and international donors should invest in the survival of the Coral Triangle because of its profound economic and political impact. Maurice Knight, chief of party of the USAID Coral Triangle Support Partnership, said the international donors and national governments should address the preservation of the regional reefs since it has massive socio-political impacts beyond the Pacific. He noted that the cost of saving the Coral Triangle is huge. “We need to come to grips with the costs of conservation,” he said, adding that ignoring the health of the area would be more expensive for the countries in the long run. The collapse of the Coral Triangle could lead to lesser sources of food and livelihood to millions of people all over the region, Knight said. This could lead to political instability and conflicts, as well as internal and external migration, making the Coral Triangle's health a “global” issue. 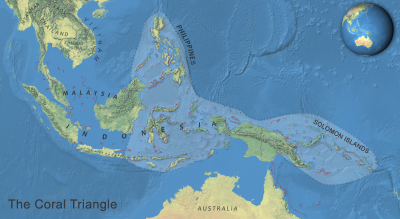 The Coral Triangle Initiative, which started in 2009, is an alliance of six countries in the so-called Coral Triangle region, the center of marine biodiversity in the world. The initiative, which is supported by the governments of Australia and the United States, aims to preserve the health of the coral reef systems in the region. The regional waters provide various services to more than 130 million people living in the region. The reef ecosystems are sources of food, employment, and revenue from tourism for the Coral Triangle countries. The World Resources Institute released the report Reefs at Risk on Monday at the International Coral Research Conference in Cairns, Australia, which put a spotlight on the status of corals in the Coral Triangle. According to the WRI, 85% of the reef cover of the Coral Triangle is in decline. The threats come from overfishing, watershed-based pollution, and coastal development. Factors such as climate change, ocean acidification increase the number of threatened reefs to 90%, the WRI study said.